So the Spring of 2016 is upon us. Hopefully we will get a pleasant Summer to come once things warm up a bit. Our team are very busy thankfully with a number of jobs throughout the country on-going. As you will read below we are busy fitting secondary glazing, flyscreens and of course the ever popular draught-proofing products. We have just completed Sound Proofing and noise reduction work on the windows of terraced homes on Dartry Rd, Rathmines, Cowper Rd, Rathmines and at Cabinteely, Dublin where our clients had road noise issues. On a link Rd between South Circular Rd and Kevin St, Dublin (Henrietta St) we have just completed a Sound Proofing / noise reduction contract on the windows of a basement apartment to enable our client to live comfortably without having to worry about road noise issues. A Sound Proofing / Energy Saving project has just been completed on private home, which was listed, in Rathmines Upper and on Kennilworth Rd, Dublin. Both homes had original Single-Glazed Sliding Sash windows in need of Energy Savings and noise reduction benefits. Windows were rattly, losing expensively generated heat through gaps in joints and through the 3mm glass. Our Energy Saving Secondary Glazing System was the answer, using acoustic glass to minimise noise levels. We have completed our Secondary Glazing work for Energy saving benefits on a period farmhouse in Killucan, Co. Westmeath. Our client had considered, reluctantly, removing his perfectly good windows and replacing them. The windows were the original Georgian-style, single-glazed sliding sash. They had become warped and letting in too much fresh air, so our client decided it was better to ''heat his feet and not the street''!!! The results have been immediate. He and his family now have a much more cosy home and wonderful savings on fuel costs. Our most recent Sound Proofing / Noise Reduction contracts were in The Dingle Benner Hotel, The Lantern Townhouse Guest House, both at Dingle, Co Kerry. We have just completed our Sound Proofing / Noise Reduction application to all the bedroom windows at The Ashley Hotel, Cork City – with total success. We are delighted to announce we have fitted our 100th "storm door"
- a refined powder-coated, colour- coded aluminium screen, usually fitted onto its own extension framing, which can be fitted outside of any door to help protect the existing door from the elements. 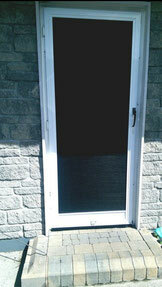 The Storm Door can eliminate the possibility of having to change your beautiful hardwood, uPVC or Aluminium door. We have just been contracted to provide our Secondary Glazing services at ‘’The Lord Bagnall Trust’’, Castleblayney, Co. Monaghan. This is a wonderful Period Building consisting of two floors of living quarters, with more than 20 beautiful Sliding Sash Windows. We also begin work on Sound Proofing projects in Ballybofey, Co. Donegal and The Hardwicke, Dublin City along with continuing work at The Merrion Hotel, Dublin..
We will also be completing Flyscreen projects in Enniscorthy, Co. Wexford, The Naul, Dublin, Tubbercurry, Co. Sligo, HSE Mayo General Hospital, HSE St Ita’s Hospital, Newcastlewest, Co. Limerick and at private nursing homes at Convoy, Co. Donegal. Our Secondary Glazing System has been the choice of architect on a private residence on hardwood windows in Darcytown, Balbriggan, Co. Dublin. We will advise of our client comments upon completion.